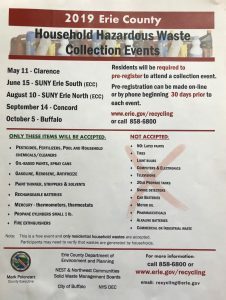 Registration is now open for the May 11th Household Hazardous Waste Collection in Clarence. This week is Recycling Week in Eden. Next Bulk pickup is the week of May 5th. View the April 10th Eden Town Board meeting. View the March 27th Eden Town Board meeting. 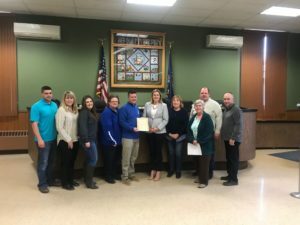 Eden Town Board declares April 8th -12th Boys & Girls Club Week in the Town of Eden. Friday night Family Swim – Tonight 6:30-8:30pm at the Eden High School pool. $5 a person/ $15 for a family – Last family swim for the season. 2019 Town and County taxes are due without penalty by March 15th. The Town Clerk’s office will have extended hours Thursday, March 14th and Friday, March 15th from 8am-6pm. A 24- hour locked drop box is located at the side door of the Town Hall. 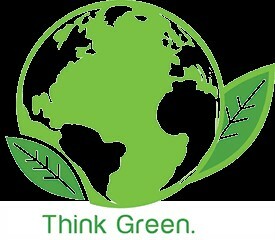 To make an on-line credit card payment log on to www.edenny.gov (fees apply). Our next Town Board meeting is March 13th at 7pm. Click here for the updated agenda. NO Pickleball Saturday, Mar. 9,2019. Will resume on Monday, Mar. 11, 2019 at 7Pm at Eden Elementary. Ice Rink Open, Bring Skates and enjoy the rink. Eden Kickball Tournament this Saturday, Mar. 9th starting at 11AM at Swartz field. O’Brien’s Food Truck will be open at 11AM at Swartz. Next Bodysculpting Session starts March 18th thru May 10th. Registration at any class. Walk-ins welcome. 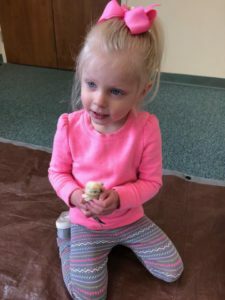 Classes run Monday, Wednesday and Friday at the Eden United Methodist Church from 9:45- 10:45 AM. Next Kempo Karate Session starts March 18th thru May 23rd. 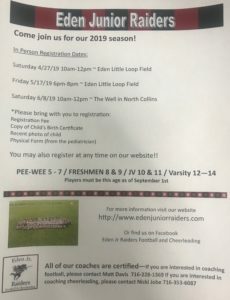 Visit the Town of Eden Recreation Webpage to register online. Classes are Monday and Thursdays form 6 – 7PM or 7 – 8PM. Everyone is looking to save money and to be safer, here is a way to do both. ACES is sponsoring a Safe Driving Course at the Eden Town Hall on Wednesday, April 3rd from 9:00 AM to 4:00 PM. Contact Barb Caffery for more information (Barb will be on a fantastic vacation until March 20th) at 992-4896 or contact the Town Hall at 992-3408. There will be a 1 hour lunch break and two 10 minute breaks… Have lunch at one of our fine Eden eateries or bring your lunch to eat at the town hall. This class will entitle you to a 10% discount on auto insurance for 3 years (the savings part). If you own a commercial property in the Eden Business District Target Area, please attend this meeting. This grant only includes businesses with the follow addresses: 8517-8572 North Main Street, 8584-8703 South Main Street, 2763 & 2674 West Church and 2777 East Church. The updated Permit Fees can be found under the Building Department of this website. Adult Basketball will be held at the GLP on Wednesdays and Fridays from 7-9pm. Put out your garbage and recycling totes this week. No Pickleball on Monday, Feb. 25th…..it will resume on Saturday from 9-11am at the Elementary school. Reminder: Summer recreation employment positions open for summer camp/ mini camp/ grounds & maintenance/ swim instructors/ lifeguards….please see the website www.edenny.gov/recreation for the application. No Pickleball this Saturday (2/23). Pickleball will resume Monday (2/25) from 7-9pm at the Elementary School. The Assessor’s office will have extended hours on February 25th & 26th from 9am-4pm. HEAP (Home Energy Assistance Program) will be at the Eden Town Hall on Wednesday, February 20th from 9am -4pm to help you apply for assistance. Eden now has an ice rink. It is located on the basketball courts on Legion Drive. It will be open today at 2pm! Free hot dogs this afternoon to those who skate. Please bring your helmet and ice skates. Garbage ONLY will be picked up this week. Please make sure your garbage is in the tote. 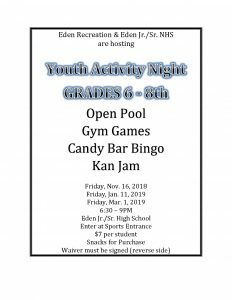 This Friday: Family Night Swim at the Eden High School from 6:30pm-8:30pm. Pickleball will be at the GLP this Saturday from 9am-11am. The Eden Town Board along with several other communities across the State have passed similar resolutions to the one below asking to restore AIM (Aid and Incentives to Municipalities) funding that has been taken out of the Governor’s proposed budget. We were informed today that it will be fully restored and while this is good news for our town, we will still continue to push for a long overdue increase. The Town Hall will be closed on Monday, Feb. 18th for President’s Day. View the February 13th Eden Town Board meeting. Paper copies of the application are available at the Town Hall. Recycling Week – Put out garbage and recycling totes this week. Starting this week Yochum Road’s garbage pickup will be on Thursdays. Our next Town Board meeting is February 13th at 7pm. Click here for the updated agenda. There is Adult Power Volleyball tonight at Eden Elementary at 7:30pm. No Adult Basketball on Friday nights until March 1st. This is bulk garbage week – you may put out one big item and one appliance along with your regular garbage tote. There will be pickleball on Saturday (2/2) at the GLP from 9am-11am. The Travel Advisory for the Town of Eden has been cancelled. We want to thank our residents for staying off the roads for the past two days and give a big thanks to our Highway Department and Emergency Services for all their hard work keeping our Town safe. Erie County has issued a State of Emergency and a travel ban. This includes the Town of Eden. We are currently under a blizzard warning and conditions in our town are bad. Please stay off the roads and in your homes. 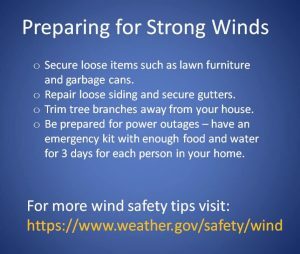 We will be issuing a travel advisory for the Town of Eden. There should be no unnecessary travel within the Town of Eden until further notice. Town Hall will be closing and all evening activities. You can sign up for calls, email or text. View the January 23rd Eden Town Board meeting. Get a team together for a kickball tournament on March 9th. Register now! Our next Town Board meeting is January 23rd at 7pm. Click here for the updated agenda. Friday Family Night Swim is this Friday, Jan. 18th from 6:30 – 8:30 PM at the Eden High School. We are excited to announce that with the implementation of the 96-gallon recycle totes in 2018, Eden recycled 209 tons more recycled material than in 2017. This is equivalent to 418,000 pounds! View the January 9th Eden Town Board meeting. The new fitness center located at the Eden Middle/ High School is now open for residents. You will need to call ahead to register at 992-3626. The fitness center is open Monday – Friday 5pm- 9:30pm and Saturday 8am- 12pm. Click here for more information on the Eden CSD Fitness Center. Our next Town Board meeting is January 9th at 7pm. Click here for the updated agenda. Click here for the waiver that each child must have signed. Pickleball will be starting tonight at 7:30/7:45pm. The new garbage recycling calendar and bulk week dates are on our website. Paper copies of the information are available in the Town Clerk’s office. Click here for the updated garbage information. Eden Planning Board Vacancy: An alternate member position is open on the Eden Planning Board, this is a one-year position. If you are interested in serving as a volunteer on this board, please go to our website for an application. Responsibilities of board members include reviewing site plans, major subdivisions and any matter referred by the Town Board for approvals. The week of Dec. 31st: Garbage and Recycling pickup will be delayed one day. The next bulk garbage pickup is the week of January 7th. 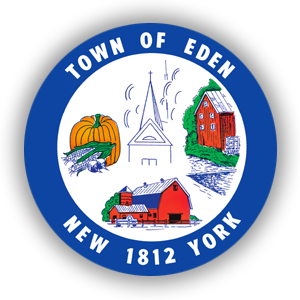 Did you miss the Eden Town Board meeting on December 26th? You can view now. Our next Town Board meeting is December 26th at 4pm. Click here for the updated agenda. 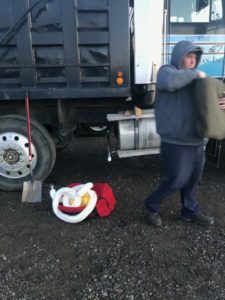 Reminder: During the week of Dec. 24th – Dec. 29th garbage pickup will be delayed one day. Only garbage in the totes will be picked up. There will be no adult basketball tonight….it will resume January 5th. Eden has been awarded 2 Grants! 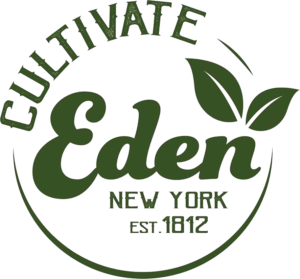 Eden was named a recipient of the New York State Main Street Grant for $300,000. This grant will assist local businesses to revitalize/enhance their building. It is a 50/50 match grant so there is a potential to bring $600,000 of improvements to Eden’s hamlet business community. Grant administration will begin in early 2019. Businesses that are eligible for the funding will be contacted by the Town. In addition to the NYS Main Street grant, Eden was also awarded a NYS Parks Grant in the amount of $20,000. The Town of Eden will develop a feasibility study for the preservation and adaptive reuse of Croop’s Mill on Bley Road along Eighteen Mile Creek. The study aims to identify necessary measures to stabilize the structures, capitalize on its heritage, develop means for access to the Creek, expand economic opportunities through recreation and tourism, and provide an educational connection to agriculture. We will not have Pickleball on Dec. 22nd. It will resume on Jan. 5th. Looking for a family activity tonight (Dec. 14th)? Join us for Family Swim from 6:30-8:30pm at the Eden Middle/High School pool. You can register at the pool. The fee is $5 per person/ $15 per family. 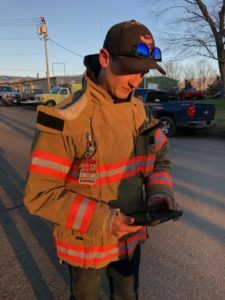 Did you miss the Eden Town Board meeting on December 12th? You can now view it at the link below. Our next Town Board meeting is December 12th at 7pm. Click here for the updated agenda. Our next town board meeting is December 6th at 5:30pm. Click here for the agenda. 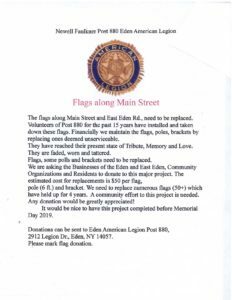 If you would like to sign up to receive periodic updates from the Town of Eden via email, please enter in your name and contact information.